People and groups in the community who have gone the extra mile for Melksham were honoured last week at the Mayor’s Reception. 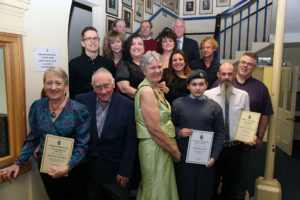 Five Community Service Awards were given to: • Anne-Marie Bartells for her work for the Party in the Park and River Mead School; • John Crook for his work with a number of local organisations and charities; • local band Female of the Species for their fundraising; • Melksham Music and Drama were recognised for 50 years of entertaining the town; • and Graham and Jenny Butcher were honoured for their volunteer work with the Bowerhill Residents’ Action Group. An Achievement Award was also presented to local group, parkrun. Pictured, Mayor Adrienne Westbrook with the award winners. Full details are on page 23. John Crook received his award for his work with a number of local organisations and charities. His nomination said, “John has always been proud of his Melksham heritage and has worked tirelessly to make sure that Melksham residents are well represented. John retired as Town Clerk nine years ago. However, this was not the end of his commitment to helping Melksham residents. “He was treasurer of Melksham Town Football Club for many years. He also chaired Melksham Link for many years and was instrumental in bringing more volunteer drivers into this organisation. “He has also been chair of Melksham Charities for around five years, making sure that the trust fund is used for the charitable purposes that it was set up for. Local band Female of the Species were recognised for their fundraising. Their nomination said, “Female of the Species are five female singers who all front their own bands locally. Each year they get together as Female of the Species to put on a concert in the Assembly Hall, with all proceeds going to local charities. In previous years they have raised funds for Melksham MIND and Wiltshire Air Ambulance (air base appeal). Local group Melksham Music and Drama were recognised for 50 years of entertaining the town. Their nomination said, “This year marks the 50th anniversary of the Melksham Music and Drama Group. For these many years they have provided Melksham with a large variety of shows. The pantos are much-loved by young and old. Graham and Jenny Butcher were honoured for their volunteer work with the Bowerhill Residents’ Action Group (BRAG). Their nomination said, “Graham and Jenny have been instrumental in ensuring Bowerhill and indeed Melksham is such a terrific place to live. They began their voluntary work with BRAG. Whether it is organised litter picks or helping the less fortunate or elderly residents, they lead from the front and always have done. Volunteer group parkrun was recognised for its organisation of free weekly 5k run held every Saturday at 9am in King George V playing field. Their nomination said, “parkrun has just celebrated its first birthday. The organisers and volunteers of this free event have created a safe and excellent environment for runners and walkers of all abilities and ages to help their physical and mental wellbeing. “They are a fantastic group of people who volunteer their time and help the community of Melksham to come together once a week and support and encourage everyone who takes part. Also at the reception last week, Poppy Fullock from Melksham’s Air Cadets – 2385 (Melksham) Squadron – was named as the mayor’s cadet. Poppy will assist the mayor at civic functions for the forthcoming year.